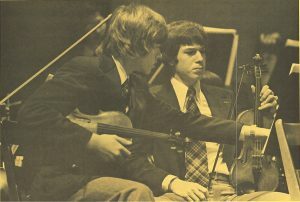 The orchestra’s education and outreach initiatives began as early as the 1960’s with a concert held at Collegiate specially programmed for children. Mr. Griffin, supervisor of music for the school board at the time, visited elementary schools to introduce students to the music from the program and encourage them to attend the concert. This was a starting point to launch the Children’s series of concerts. Bassoon Demonstration. Click on image for transcript of newspaper article. By 1968 a woodwind quartet and a string quartet were established to give school concerts. They traveled around the region to introduce students to orchestral instruments and music. The following year the school concerts were expanded, a brass quartet was added, and they reached a total of 35 different schools. 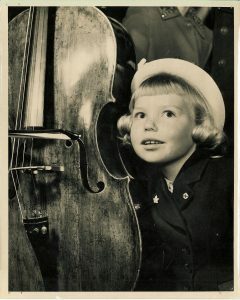 Young players were also awarded scholarships to further their musical education. 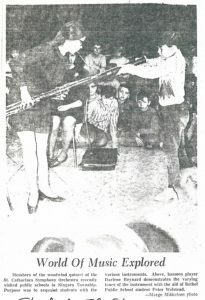 After the move to Symphony House, the association started the Symphony House Music School. Private lessons were offered by musicians from the orchestra. There were also beginner classes for children as young as 4, in the Orff method. In the 1990’s the Flying Carpet Concerts were introduced. These shows were aimed for school-aged children, and based on famous stories. The groups (NSO musicians) that performed these shows travelled around Niagara, as well as outside the region (Hamilton, Mississauga, etc.). Composer in the Classroom was established in 2001 by Dr. Sasha Weinstangel. 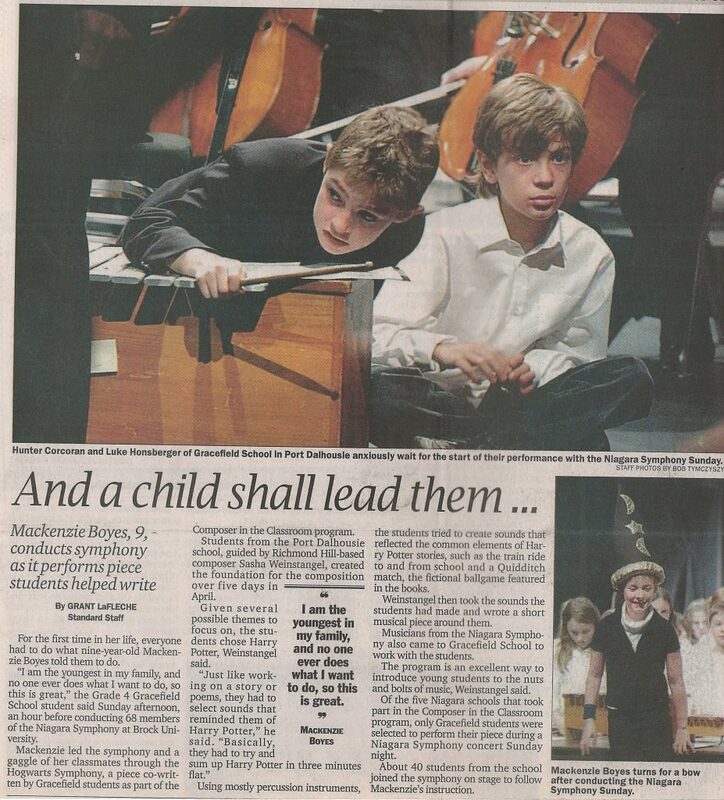 By 2004 the programme was supported by the Niagara Symphony as well as community, corporate and government sponsors and the two local Boards of Education. Under NSO Associate Conductor Laura Thomas, the elements of the Composer in the Classroom programme changed from modest soundscape explorations resulting in student performances to student-written compositions which were work-shopped then performed by professional musicians from the Niagara Symphony. The most recent education outreach program is the Niagara Symphony Orchestra Story String Quartet. In the 2016-17 season, 4 principal string players travelled to schools in the Niagara Region, introducing classical music and encouraging active, discerning listening among children in grades 1 to 6. Detailed study guides were created to support educators and help them implement the program into their lessons. Education programming is offered to inspire and nurture a love of music that lasts a lifetime.